-If you have read our blog article on the advantages of water fountains for cats and want to find out more, or are already sold on the benefits of water fountains and are wondering which fountain to buy, then you have come to the right place! Here we have put together details of the 15 most popular drinking fountains suitable for pet cats and dogs, so you can easily compare them and decide which one is best for you and your pet. We’ve also shopped around, and tried to find the best deals for these fountains, so you can save money as well! Some of these fountains can be purchased at a cheaper price from zooplus.co.uk, however as they are a German company, some of the fountains are supplied with a German two-pin mains plug plus a UK adaptor so please be aware of this when ordering. 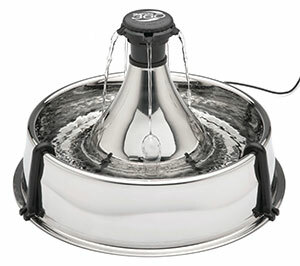 The Drinkwell Platinum pet fountain is an updated and larger version of the much-loved original Drinkwell fountain which has proved to be very popular for a number of years. The all-new design features the same 5 inch high free-falling stream of water, which is just like the water flow out of a tap. The fountain also has a large area at the bottom for those pets who like to drink from a bowl. The integrated reservoir has a larger than average capacity of 5 Litres, so will not require refilling as often as many other fountains. This fountain is made from plastic, and is dishwasher safe for easy cleaning. The fountain includes a replaceable charcoal filter which removes bad tastes and smells, and an additional pre-filter helps catch larger debris like pet hairs and bits of food before it reaches the charcoal filter. It is recommended that the filter is replaced every 2-4 weeks. Click here to buy replacement filters. The low-voltage (12V) submersible pump is virtually silent in operation, and is designed to be disassembled for easy cleaning. It’s also adjustable so you can easily set the water flow to the desired rate. The original Drinkwell fountain has been around for years, and is very popular. The patented free-falling water stream is just like the flow of water out of a tap, so is perfect for cats who like to drink straight from your sink. The 1.5 Litre reservoir is one of the smaller fountains available though, so you may want to look at a bigger fountain such as the Drinkwell Platinum if you require a larger capacity. 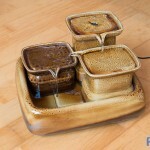 The fountain is made from plastic, and comes apart easily for cleaning – it is dishwasher safe too. It also has a replaceable charcoal filter which removes bad tastes and smells, and this should be replaced every 2-4 weeks. Click here to buy replacement filters. 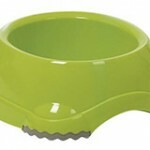 The water flow is adjustable, so you can set the water stream speed to exactly how your pet likes it. The Drinkwell Mini fountain from PetSafe is a space-saving fountain that uses the same innovative watering system as the larger fountains in the Drinkwell range. The patented free-falling stream of water is perfect for pets who like to drink from the tap, or they can also choose to drink from the reservoir at the base. 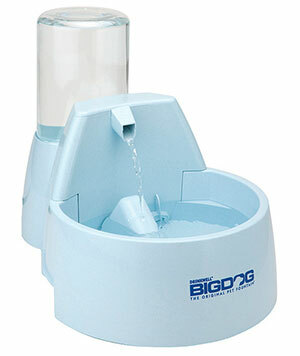 This is a very small fountain, with a capacity of only 1.2 litres, so is better suited to your kitten, puppy or small pet. Like the other fountains in the range, the Drinkwell Mini is fitted with a charcoal filter which removes debris and bad tastes and smells from the water, providing your pet with clean, fresh tasting filtered water. It is recommended that you replace these every 2-4 weeks, and you can click here to buy replacement filters. The fountain also features an adjustable flow control so you can chose how fast the water flows. The plastic housing is easy to take apart for cleaning, and it can be washed in the top rack of a dishwasher. 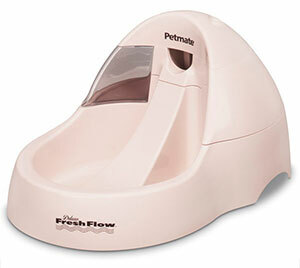 The Avalon Ceramic Pet Fountain from PetSafe is a high quality, ceramic water fountain for pets. It may seem a lot more expensive than other plastic fountains, but ceramic has several advantages for use in a drinking fountain. The tough material isn’t susceptible to small scratches like plastic, which allows bacteria to build up that can cause chin acne. It also helps keep the water cooler, and the heavier weight means the fountain is less likely to be knocked, which can cause spills. The 2 litre capacity is a generous size, and the elevated drinking dish at the top is ideal for senior or arthritic pets. They also have the option of drinking from the two free-flowing streams of water, or the large reservoir at the base. Replaceable foam and charcoal filters helps keep the pump and fountain clean, by catching debris such as pet hair, and bits of food and removing bad tastes and smells. You can buy replacement Foam and Charcoal filters online. The fountain is easy to clean, and dishwasher safe too (excluding the pump). The Drinkwell 360 Stainless Steel Pet Fountain was developed by a veterinarian, and is designed to provide 3.8 litres of fresh, filtered water to your pet via multiple free-falling streams of water. The multiple streams and circular design make it possible for pets to drink from any angle, so this fountain is perfect if you have more than one pet. Stainless Steel is very hygienic, unlike plastic fountains, which are susceptible to small scratches which can cause bacteria to build up. It is also very easy to clean, and is dishwasher safe too (excluding the pump). A replaceable charcoal filter removes bad tastes and odours, while a replaceable foam filter keeps the pump cleaner by catching debris like hair and bits of food. Click here to purchase replacement filters. 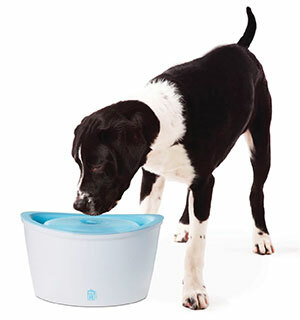 As the name suggests, this Drinkwell Big Dog Fountain is ideal for the larger breed dog, or for households with multiple pets. The fountain has a very large capacity of 8.5 litres (including the attached reservoir), and a 12 cm (5 inch) deep bowl to prevent splashing and spills while your dog drinks. The patented water spout design is the same as on many of the other Drinkwell fountains, and provides a 12cm free-falling water stream into the reservoir at the base. The attached 3.7 litre reservoir at the back allows for easy refills and increases the capacity of the fountain to 8.5 litres. The fountain also features an adjustable flow-rate control so you can adjust the speed of the water flow. The fountain is fitted with a replaceable charcoal filter that helps keep the water clean by inhibiting bacteria growth, and reducing saliva within the water. It is usually recommended to replace the filter every 2-4 weeks, and you can click here to buy replacement filters. The fountain also features an anti-bite cord cover to protect the electric cable from damage from pets that like to bite cables. The fountain is easy to take apart for cleaning, and the main bowl is dishwasher safe too, although the additional reservoir and motor are not. 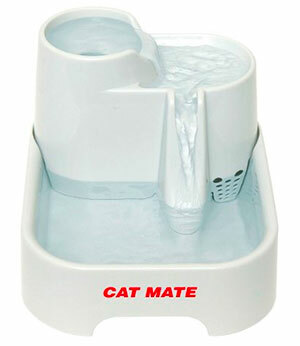 The Cat Mate Pet fountain is another classic water fountain that has been very popular for a number of years. 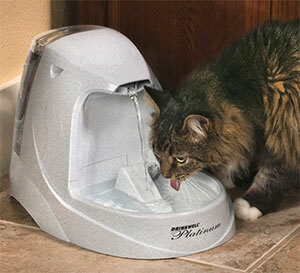 The plastic fountain features 3 drinking areas on different heights, so your cat can choose to drink from the bubbling outlet at the top, the flowing water stream or the wide bowl at the base. The fountain has a capacity of around 2 Litres, which is around the average size for cat water fountains and so it will provide plenty of fresh water without taking up too much room. The fountain is fitted with a polymer-carbon filter to purify the water, and replacement filters are available to buy online. It is recommended to replace these every month. The fountain itself is easy to clean, and the bowls are dishwasher proof too. The low-voltage pump is fitted with a 3m long lead, and is very quiet in operation. It is easily replaced if it fails, and spares are readily available. 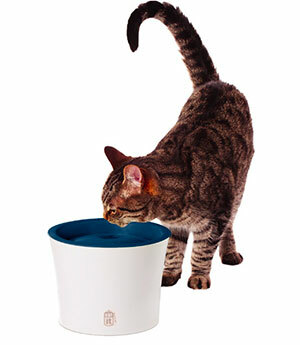 The Catit Senses Drinking Fountain from Hagen is suitable for both cats and small dogs. It is designed with a large surface area so that the water can absorb more oxygen, which results in fresher, better tasting water. 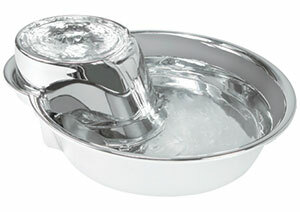 The body of the fountain is made from plastic, and is dishwasher safe for easy cleaning. 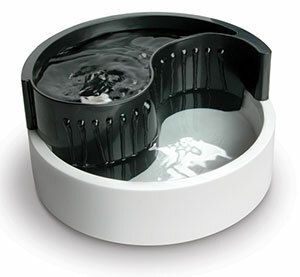 This fountain includes a dual function filter that absorbs water impurities such as debris, food and hair. It also softens hard water by removing excess calcium and magnesium (typically found in tap water) to help maintain a healthy lower urinary tract. Click here to buy replacement filters. 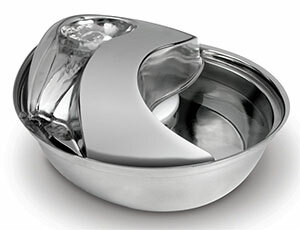 The Catit Fresh & Clear Pet Drinking Fountain with Food Bowl from Hagen is ideal for both cats and small dogs. 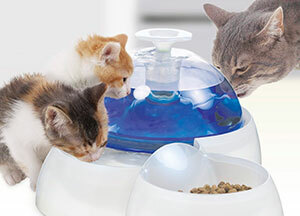 The multi-surface drinking areas allow your pet to drink from either the bowl or directly from the dome depending on their preference. The larger than average capacity of 3 litres means there will be a plentiful supply of fresh, filtered water available without you needing to refill the fountain every day. As an added bonus, a matching food bowl is included too and it is also possible to purchase a custom floor mat. One useful feature is that this fountain includes a power cord protector so cats can’t chew on the electric power cord. The fountain is made from plastic, and the curved design means there are very few edges for dirt to build up in. The replaceable carbon filter collects food, hair and other debris, and also helps remove bad tastes and smells. It requires replacing approximately every 3 weeks. Click here to buy replacement filters. This Fung Shui design drinking fountain from Pioneer Pet is made from plastic, and stands out with it’s stylish Feng Shui “Yin and Yang” design. It has a 1.7 litre capacity, and is relatively small compared to some of the other fountains available which may be an advantage if you don’t want it taking up too much room. The fountain is also easy to take apart for cleaning. The small electric pump is adjustable so you can choose what flow speed you want, and the fountain contains a replaceable charcoal filter to ensure the water is clean and pure. Click here to buy replacement filters. The Pioneer Pet Raindrop Stainless Steel Pet Fountain is a stylish water fountain for cats and small dogs that will look great in your home. Not only does it look good, but unlike plastic fountains, which are susceptible to bacterial infection, the stainless steel construction is very hygienic. It is also very easy to clean, and is dishwasher safe as well. The 1.8 litre capacity is around the average for a standard size pet fountain, and the adjustable pump allows you to choose the speed of the water flow. The fountain provides 3 areas for cats to drink from – there is the bubbling area on top, the flowing stream down the side of the fountain, and then the gently flowing pool of water in the reservoir at the base. If you don’t want to spend quite as much on a water fountain, then you might want to look at the same design of fountain, but made from plastic – find out more details here: Pioneer Pet Raindrop Plastic Fountain. The Big Max stainless steel drinking fountain from Pioneer Pet is large capacity yet stylish water fountain for cats and dogs that will look great in your home. The fountain is a larger version of the Raindrop fountain above, and has a greater capacity of 3.4 litres, and features an extra-large drinking area perfect for larger breed dogs, or households with multiple pets. The stainless steel construction is tough and very hygienic unlike plastic fountains, which are susceptible to bacterial infection when they become scratched. It is very easy to clean too, and is also dishwasher safe. It features a replaceable charcoal filter which helps provide healthy and clean drinking water. It is recommended to replace this every 2-4 weeks, and you can click here to buy replacement filters. The Petmate Deluxe Fresh Flow fountain is a simple, yet modern looking fountain designed to blend in with today’s kitchen appliances. The freshly filtered water runs like a waterfall out of the upper part, over the unique “no-splash” water slide, and back down into the reservoir quietly, and without splashing. This gives a very quiet operation, however if your cat likes to drink from a running tap, then maybe something like the Drinkwell Platinum would be more suitable. 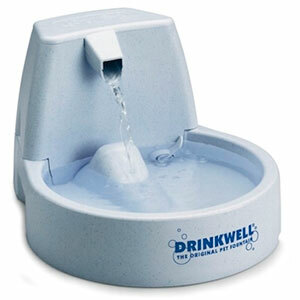 Like most pet fountains it also contains a charcoal filter to provide clean and filtered water. It is recommended to change the filter every month – click here to purchase replacement filters. The Dogit Fresh and Clear Drinking Fountain from Hagen is designed for dogs, and has a larger capacity (6 litres) than most other pet water fountains, so is ideal if you have large or multiple pets. The large surface area allows for greater oxygenation of the water, leading to fresher, tastier water for your pet. This fountain is larger than most, and the elevated position is better for large breeds, older dogs or those with arthritis or joint problems. It is made from plastic, and the fountain is simple to take apart for ease of cleaning. A foam/carbon multi-stage filter removes impurities and debris from the water, and is easily replaceable – it is recommended to replace it every 3-4 weeks. Click here to buy replacement filters. This ceramic drinking fountain for cats from Lucky-Kitty is stylishly designed to ensure your cat drinks enough water, while looking good in your home, and being easy to live with. 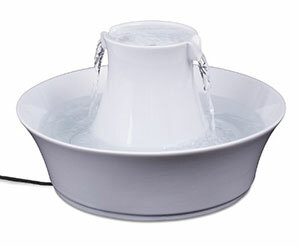 This ceramic fountain is virtually silent, easy to clean, hygienic, stable and spill-proof. It’s also very economical because you’ll never need to buy expensive replacement filters again, due to it’s non-filter design. It is made from ceramic, which has several advantages over the more commonly found plastic fountains. The heavier weight means this fountain is almost impossible for your cat to move or tip over, and the ceramic material keeps water cooler. The high-gloss finish is very easy to clean, and more hygienic as the tough ceramic material isn’t susceptible to small scratches where bacteria can build up. The rounded design also eliminates inaccessible nooks and crannies which are difficult to clean. Even better – it’s also dishwasher safe! The fountain features 3 different drinking zones for your cat to choose from. A “bubbly” zone at the top for cats that like to drink water directly from the source, a sloping “water slide”, where the water trickles down over special ceramic ripples and a water basin at the bottom containing a constant supply of fresh, moving water. 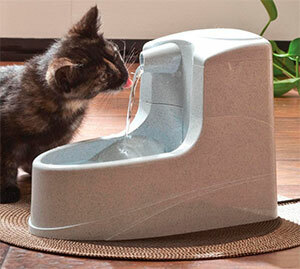 Your cat can drink directly from this basin, even when the fountain is switched off. 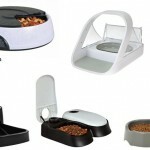 Hi, thanks for writing this page – I got the Petsafe Drinkwell fountain for my cat and she loves it! She now drinks more water than she did before so I would recommend anyone who hasn’t got one to get one.